Why hello there! Recently I made a post on writing a guest post for the freckledfashionista. I have some great bloggers lined up to share their post on my blog. The first guest post is from the Tween in Between. Enjoy her guest post, and don’t forget to comment and let her know what you think of it! Hi! I’m Tweeninbetween, the author of the blog Tween in Between! 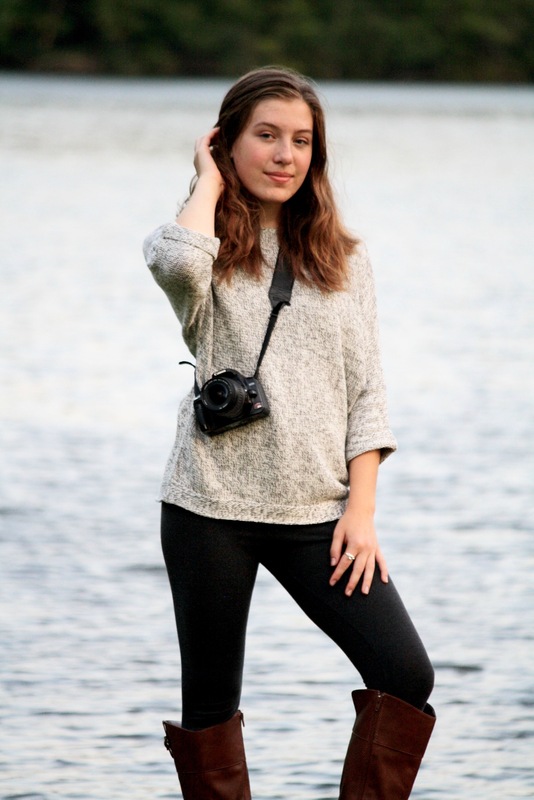 I’m super excited to be doing a guest post here on Freckled Fashionista! Because school is just around the corner, I wanted to share with you five different back-to-school outfit ideas, complete with sketches! I’ve been sketching and sewing for about three years, and since we’re all so excited to go back to school (NOT! ), I thought this was the perfect thing! The first one is The Rebel’s School Uniform. I really love this one! I think it’s just super cute and fun! I like the boots just because…well, they’re boots! Who needs another reason??? The shirt is probably my favorite part, because it ties the whole outfit together and is definitely the statement piece of this sketch. I like how this outfit could be worn at any time of the year, because, like I said, it’s so cute, but it gives off just enough ‘school’ vibe that it makes the perfect back-to-school outfit! This outfit is (as the name suggests) pretty preppy, but it’s still very stylish! I like the way the pink looks with the blue jeans! Of course, the shirt has a collar, and the model is wearing capris and black flats – the outfit has to live up to its name! However, I think this one does a great job of being preppy without being childish! In the back to school category, it gets an A+++ in my book! I think this one just might be my absolute personal favorite! I love, love, love the boho-beach-chic vibe it gives off, and it’s definitely clear the wearer does not want summer to end! (Hmmmm…maybe that’s why I like it so much. I don’t want summer to end either!) I really like how all the colors go together! This outfit is so versatile, too! The sandals are super cute, and so is the skirt! You could wear it to the beach or to a restaurant! In my opinion, that makes it an ideal school outfit! Ooh, this is another good one! I just think it’s sooooooo stylish and absolutely adorable! The sweater, pleated schoolgirl skirt, and messy bun bring the ‘nerd’ element, and the fishnet tights and boots add just the right amount of pizazz! This outfit just has everything! Cute boots? Check! Adorable skirt? Check! Girly sweater? Check! Just-the-right-amount-of-messy hair? Check! I would definitely wear this to school! Guys, let’s be honest! We all wish we could wake up like that! This is another one of my favorites, simply because it’s got the perfect amount of looking like a nonchalant, thrown-together outfit. But it’s not so shabby-chic it couldn’t be worn to school! Now let’s break it down: I absolutely adore all the parts of the outfit! I love the off-the shoulder sweater, the ripped jeans, the comfy-looking UGGs, and especially the hair! (Messy bun half-up updo? Yes, please!) All in all, this is, in my opinion, a fabulous back-to-school outfit! That’s it! Thanks for reading, and of course, an enormous thank you to Abigail for letting me post here today! I had fun, how about you? 🙂 Comment which outfit was your favorite! And there you have it! Thank you! Be sure to check out Tween in Between’s blog. It’s not too late to write a guest post for the freckledfashionista! Apply here. I haven’t posted in a while….the truth is, I haven’t had much to talk about! For some reason, I don’t like sewing or designing during the summer, since it’s so hot and there’s so much to do outside that I don’t want to be cooped up indoors. 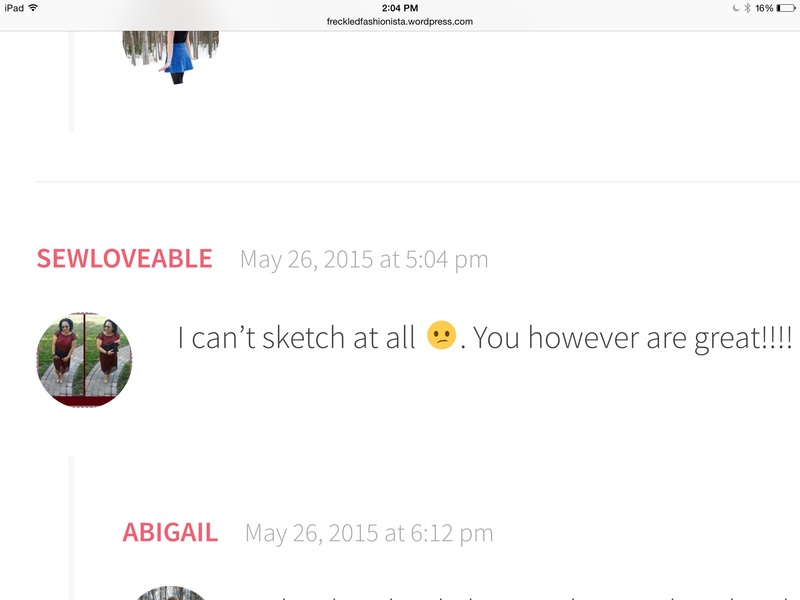 I’m sorry, Sewloveable, but how can I resist? 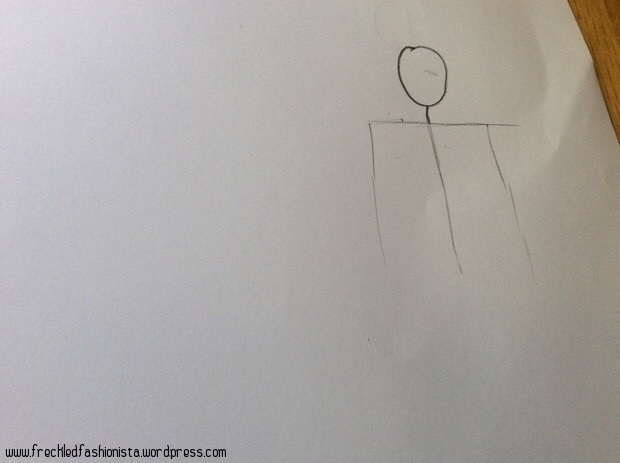 In today’s post I’m going to show all of you how to draw a figure sketch! This is super easy. 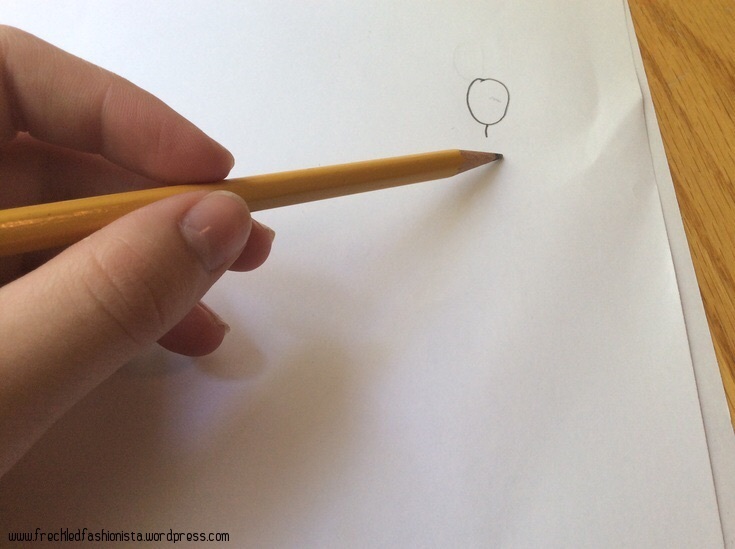 Just start by drawing a normal circle for the head and draw a line under it for the neck. 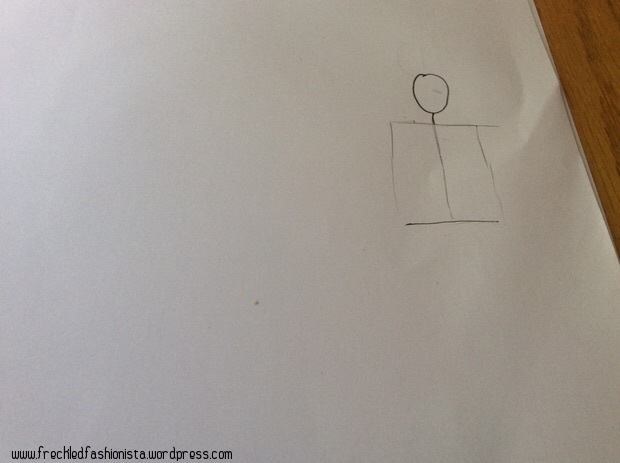 In fashion design, you basically make the skeleton of the body before everything else. 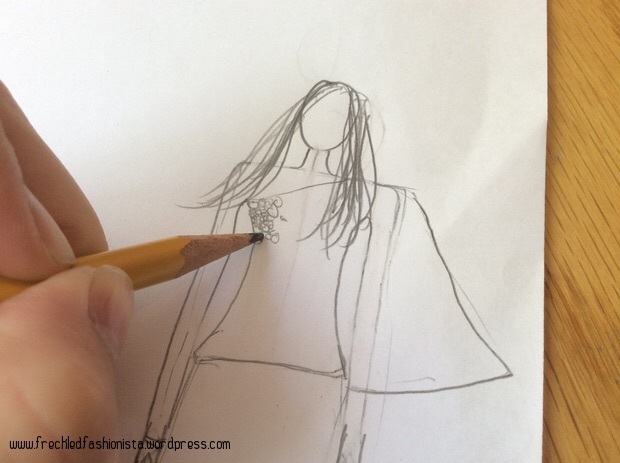 Draw a medium-length line under the neck for the shoulders. Then at each end of the shoulder line, draw the arms, which are just two lines. This is basically lines the whole time! 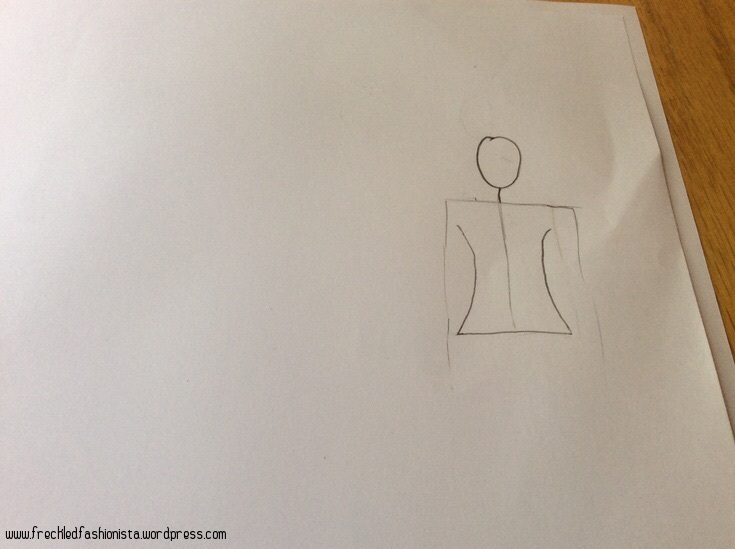 Lastly, draw the torso, which is a line connected to the neck. Don’t worry yourself with a ruler, it’s okay if the lines are not perfect and there’s always room to improve later. A line under the torso should do for the hips/waist. It needs to line up with the shoulders. 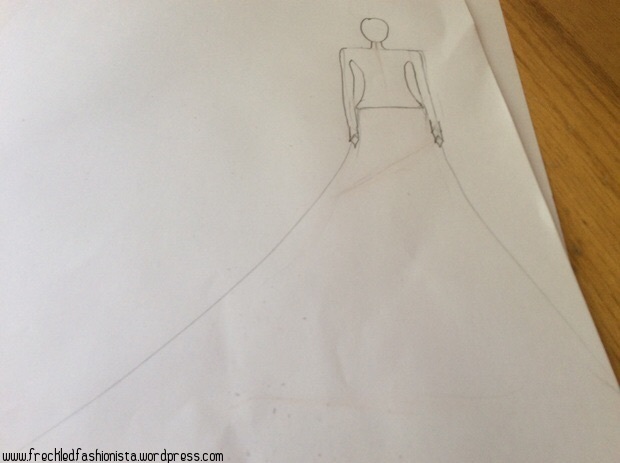 I’m designing a dress for this, so I’m not going to do the legs. Email me if you want me to do legs in a different tutorial. Time for the curves. These are pretty easy to draw if you know what you are doing. Pretened the curves are smiles, so when you turn the paper sideways it looks like a smile. Make the curves come up to the armpit area. Bear with me, we’re almost done! Arms! Probably one of the easiest steps, they’re like sticks. You’re just going to add an extra line to the other skeleton arm shape you have so far. For the hands, I normally just draw little diamonds. I added my skirt here too, which is long and flowing. You can choose whatever you want. Whoa, I skipped ahead! Technically, you’re already done! You just have to draw your shirt, some hair, and erase your pencil lines (And color it in if you want, but I didn’t do that for this sketch). Now that you have your basic body shape down, the rest is up to you! 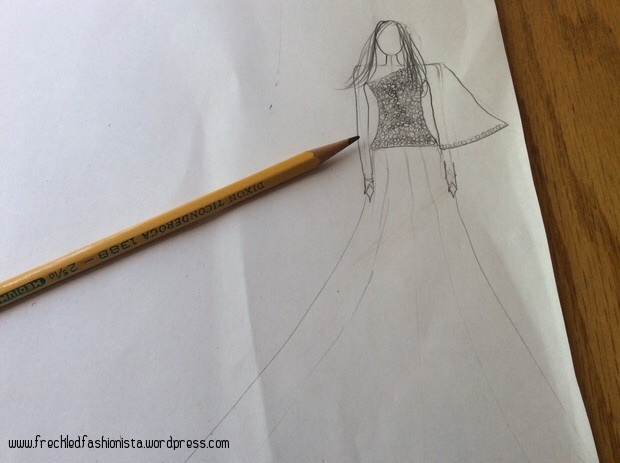 You can draw sequins, pleats, long sleeves, high sleeves…play around with it! I almost never draw a face, since I don’t want it to be drawing away from the outfit. Also, I’m bad with faces. And this is my sketch! I hope this was easy enough for you to follow. Thanks for reading, and have a good weekend! P.S. I’m still collecting sewing and fashion stories and I now have a offical page where you can tell me your sewing and fashion stories. I want your stories and I cannot wait to put them on the blog! Thanks to those that have sent me their stories! Welcome! I’m Abi, a 14 year old lifestyle blogger, photographer & lover of sour candy. Get comfy & enjoy! Disclaimer: All content on The Freckled Fashionista is Copyright © Stealing any images, text, or content on the blog is strictly forbidden.